There a little pieces of the year that I enjoy more than others. Early Octobers colors knock me out, and sunlight bouncing off that very first snow has a way of bringing a smile to my face. The change in the air in late March when the smell of mud is all around, the trees are just beginning to bud, and temperatures are beginning to hold above 40 for a couple of days. The best is that one day in Spring when the air is clear, the sky is bright blue with an occasional puff of a cloud and the temperature is around 70 degrees with a hint of a breeze. That is the day I wait for all year long. There is another time of the year that I enjoy just as much, but not so much for what the earth is doing around me, although that has a lot to do with it as well, but what the world is doing outside my window. That time of year is now. Early September is the unofficial end of summer with the start of school. Funny, we attend school for twelve plus years of our lives, and that calender stays with us long after we have left the classroom. That last summer blast over Labor Day evaporates in a mist that lingers till the following Tuesday morning. Then, through the morning mist, down the road where the yellow lines disappear into the fog, comes the sound, and then the distinctive shape of the school buses. The start of the school year was always something I looked forward to as a kid. Now remember, I said the start of the year, the rest of the year was something I couldn't wait to get through as fast as I could. There was something about the smell of newly shaved pencils, crayons, and erasers all lined up inside a new pencil box that got my juices flowing. Tools. They were my tools , and some of them I had no clue as to what to do with them. Most pencil boxes came with a ruler, a protractor, and a compass amongst the colored pencils and erasers. What the heck was the protractor for? I figured out the compass was for carving my name in the desk pretty quickly, but the protractor had me stumped. I lived about a mile or so from my elementary school in one of those new developments built in the late 50's, early 60's. 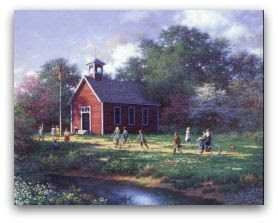 We'd walk through the neighbors yards till we came to Summer Street, and then we'd follow the roads the rest of the way till we arrived at the Memorial School, the school for grades first through third. I usually walked with my friends in rain, and snow to school, even though my father drove to school everyday to his job as the music teacher. I still wonder about that. I'd be soaked by the time I go to the end of the driveway, and he'd be pulling out, beep, wave and drive off to school all dry and snug in his Mercury. No matter, though. Despite being abandoned by my father on the road to school, the walk is something I still remember to this day. I had a routine. I'd eat the apple I had in my lunch bag on the way to school, usually finishing it about the same place on Pine Street, off Summer every morning. Even then I felt guilty about throwing an apple core onto the ground, as biodegradable as they are, so I would take the core each morning and stuff it into the exhaust pipe of the same car. Around the middle of October it go harder to stuff those cores into the pipe. It was getting a bit full. One morning I saw the blue Chevy truck from the Sunoco station in the driveway of the Apple Core Car. The mechanic was on his knees with a coat hanger, or something, reaching up inside the exhaust pipe. I played dumb, and walked real fast while whistling "The Colonel Bogey March". I looked guilty as hell. The weather in early September was mild. The mornings were cooler than a few weeks before, and the leaves had yet to change and fall onto the street for us to kick our way through. It was a the Transition. It was the time of free wheeling apple core stuffing, newspaper kicking into puddles, sweaters tied around our waists in the afternoon, and still lots of daylight left in the day to get into mischief. The daily ritual of changing from school clothes to play clothes when I arrived home became ingrained in me. Sometimes, I slip and refer to my jeans and t-shirt as my "play clothes", and hope nobody has heard me. They do. All those wonderful September feelings come back year after year. All it takes is a trigger. This year it was the school bus stopping out front of our house to pick up our neighbors little girl for kindergarten. The sounds of the bus, the door opening, and the yells of, "Goodbye, Honey! Have a great day at school!" as the bus pulled away brought back a rush of memories long locked away. That's all it took. All those sounds are like an overture of things to come. I don't think it is a sign of getting older, I've always been susceptible to memories, but I do seem to appreciate their appearance more and more each time they come knocking.